Before you scream for ice cream, a health advocacy group wants you to think about this: A sundae can have as much fat and calories as a T-bone steak dinner. "Everyone knows that ice cream isn't good for you — it's a splurge," Jayne Hurley, senior nutritionist at the Center for Science in the Public Interest, said Wednesday. "But most people don't realize how much of a splurge it is." The center commissioned a study that looked at saturated fat and calories in some of the most popular treats from Baskin-Robbins, Cold Stone Creamery, Friendly's, Ben & Jerry's and TCBY. Most of the information in the nutritional analysis was provided by the companies. A chocolate-dipped waffle cone at Ben & Jerry's has about 320 calories and 16 grams of fat. Add one scoop of Chunky Monkey ice cream and the total surges to 820 calories and 26 grams of saturated fat — roughly as much as a one-pound rack of ribs. Cold Stone Creamery's regular-size "Mud Pie Mojo" — coffee ice cream, roasted almonds, fudge, Oreo cookies, peanut butter and whipped topping — has a saturated fat and calorie level equal to two personal pan pepperoni pizzas from Pizza Hut. At 1,270 calories and 38 grams of saturated fat, eating a Haagen-Dazs "Mint Chip Dazzler" sundae is like eating a T-bone steak, a Caesar salad and a baked potato with sour cream. Susan Ruland, spokeswoman for the International Ice Cream Association, an industry group, said the study doesn't say anything people don't already know. "I think people know what ice cream is and what they're eating," she said. "They're out for a nice night with their family or an indulgence, and that's the experience they're getting." 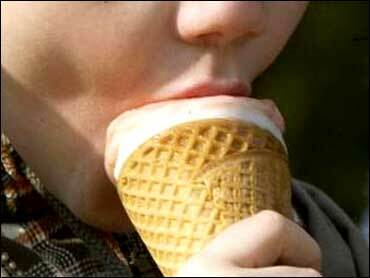 Ruland also noted that ice cream manufacturers are making available more low-fat and no-fat options. The center recommends consumers consider those products, as well as frozen yogurt, sherbet or sorbet, which run between 100 and 200 calories. And lay off the toppings, which can turn a low-fat treat into a fat-laden indulgence. The center pushed for the Nutrition Labeling Act of 1990, which required nutrition information be listed on most store-bought food items, and wants a similar law for restaurant food labeling — including chain ice cream parlors.